I received a press release this morning and thought it was worth sharing during this month of Breast Cancer Awareness. We showcase many of the products by the companies under the Estee Lauder empire on our blogs, so it's nice to see their global committment to a very worthy cause (article is not shown in it's entirety due to the length). NEW YORK, Oct. 1 /PRNewswire/ -- To commemorate Breast Cancer Awareness Month, The Estee Lauder Companies' Breast Cancer Awareness Campaign illuminated a total of 38 global historic landmarks in pink lights over a 24-hour period of time, creating a new category and achieving a new Guinness World Record entitled: "Most Landmarks Illuminated for a Cause in 24 Hours." The 24-hour period began at 12:00 pm EST on Thursday, September 30 and ended 12:00 pm EST on Friday, October 1. Guinness World Records made this official announcement on October 1, as Evelyn H. Lauder, Senior Corporate Vice President of The Estee Lauder Companies, and Elizabeth Hurley, Spokesmodel for Estee Lauder and The Breast Cancer Awareness Campaign, illuminated the Empire State Building in pink lights, commemorating an effort that began 11 years ago at the same New York City landmark. The global record attempt began in Australia on Thursday, September 30th, with the illumination of Federation Square in Melbourne and the National Library of Australia in Canberra. Illumination events then continued around the world including iconic structures such as Taj Mahal Palace & Tower Hotel in India and Burj Al Arab in Dubai, Tokyo Tower in Japan, Las Condes' City Hall in Chile and the Hotel Majestic in France, then culminating with the Empire State Building. These monuments have become international symbols of hope, with the goal that when a woman sees a pink landmark, she will be inspired to get a mammogram or seek information about breast health. Evelyn Lauder stated, "In 2000, The Estee Lauder Companies' Breast Cancer Awareness Campaign began illuminating landmarks in pink lights to alert women and raise awareness about the importance of breast health and early detection in a new and exciting way. It's been wonderful to witness an effort that began with a handful of landmarks, led by the Empire State Building, evolve into an initiative that now spans the globe." Lauder continued, "To have the opportunity to celebrate the 11th anniversary of our Global Landmarks Illumination Initiative with a Guinness World Records achievement at the Empire State Building is incredibly significant and meaningful. We are very appreciative to all of our landmark partners who have joined us to cover the world in pink, spreading our awareness message and helping to save lives." Elizabeth Hurley stated, "We are thrilled to be creating a new Guinness World Record commemorating an important initiative started by Evelyn Lauder 11 years ago. It's an honour and privilege to travel around the world with Evelyn, illuminating landmarks in pink lights and sharing our awareness with everyone we meet. 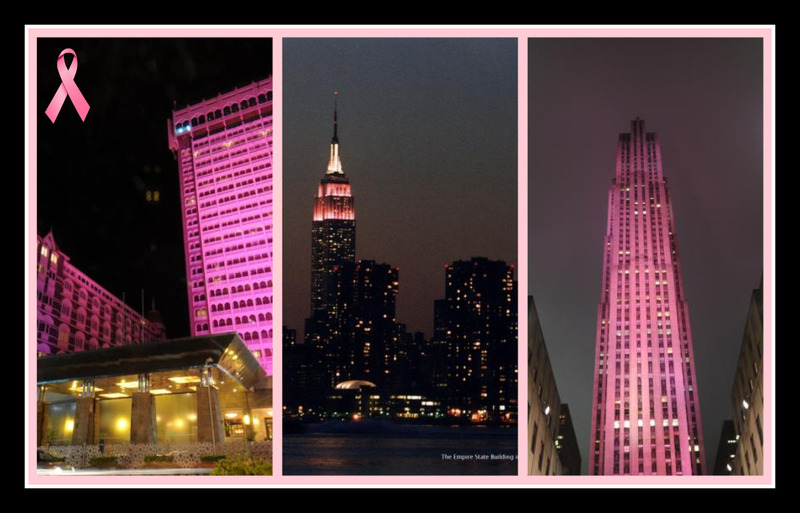 It's wonderful to see the global impact that these illuminated landmarks have, motivating women to see their doctors regularly, perform a monthly breast self exam, and get an annual mammogram if they're over the age of 40. Our goal is to spread this message to women in all corners of the world." The Estee Lauder Companies Inc. is one of the world's leading manufacturers and marketers of quality skin care, makeup, fragrance and hair care products. The Company's products are sold in over 150 countries and territories under the following brand names: Estee Lauder, Aramis, Clinique, Prescriptives, Lab Series, Origins, M-A-C, Bobbi Brown, Tommy Hilfiger, Kiton, La Mer, Donna Karan, Aveda, Jo Malone, Bumble and bumble, Darphin, Michael Kors, American Beauty, Flirt!, GoodSkin Labs, Grassroots Research Labs, Sean John, Missoni, Daisy Fuentes, Tom Ford, Coach, Ojon and Smashbox. That's pretty cool. Way to promote awareness for Breast Cancer!